BFPD responded to a motor vehicle accident on County Road 13 and 42nd St. SW. This was a two-vehicle accident with heavy damage to one of the vehicles, minor damage to the other. There were no reported injuries. BFPD responded to a commercial structure fire in a laundry mat with a possible dryer on fire inside the building. The crew found two large dryers that had over heated and overloaded the breakers causing electrical damage. BFPD assisted TVEMS with a medical call on West County Road 10E. The patient was transported. BFPD responded with Loveland Fire to a motorcycle accident on Taft Ave. A motorcyclist was thrown 100 feet into a field with a possible broken leg. The fire crew assisted Loveland Fire with loading the patient to be transported. BFPD responded to the Valley Dirt Rider track with TVEMS. A rider was injured and transported. BFPD responded to a motor vehicle accident on Interstate 25 at mile marker 249. This was a two vehicle accident with moderate damage to both vehicles and no injuries were reported. BFPD responded to a reported motor vehicle accident on Interstate 25 at mile marker 252. The vehicle involved had been moved from the highway and no injuries were reported. BFPD responded to Carter Lake for a boat that had capsized. When the crew arrived all of the parties were out of the water. BFPD responded to a lifeline alarm on Horseshoe Circle. BFPD responded to a smoke investigation in the area of County Road10E and Highway 287. The crew searched and was unable to find any fire or smoke in the area. BFPD responded to a wild land fire in Loveland but the call out was cancelled by Larimer County. BFPD responded to a medical call at Berthoud High School. A student was injured during football practice. The crew assisted TVEMS with transporting the patient. BFPD responded to a motor vehicle accident on Interstate 25 at mile marker 250. There was a single vehicle in the ditch. There were no reported injuries. BFPD responded with Mountain View Fire to a grassfire in the median of Interstate 25 at mile marker 247. The Berthoud fire crew extinguished the north side and Mountain View extinguished the south end. BFPD responded to a report of a grass fire on 2nd St. The crew was unable to find a fire. BFPD responded to an odor investigation on Bunyan Ave. The crew searched in the area and could smell a faint odor of smoke but was not able to find a source of fire. BFPD responded to a medical call on Sunbird Lane for a young child who had been stepped on by a horse. The crew assisted with transporting the patient. BFPD responded with Loveland Fire to a medical call on Jodi Lane. BFPD responded to a car fire on Interstate 25 at mile marker 254. While enroute to the incident, the call was cancelled. BFPD responded with TVEMS to a motor vehicle accident on Interstate 25 at mile marker 249. One vehicle was found in the center median with moderate damage. One patient complaining of neck pain was transported. BFPD assisted TVEMS with a medical call on E County Road 4. BFPD responded to a commercial fire alarm on 10th Street. There were no signs of fire or smoke. A piece of burnt toast had activated the alarm. BFPD responded to a motor vehicle accident on Interstate 25 at mile marker 249 on the east frontage road. A single vehicle had rolled over and sustained heavy damage. One person was still inside the vehicle. The individual was removed from the vehicle and transported. BFPD responded to a medical call at Berthoud Living Center. The fire crew assisted TVEMS with loading the patient to be transported. BFPD assisted TVEMS with a medical call on 1st Street. The patient was transported. BFPD responded to a medical call on Lakritz Rd. The fire crew assisted TVEMS with loading the patient for transport. BFPD responded to a reported car fire on Interstate 25 at mile marker 248. By the time they arrived, the fire had been extinguished. BFPD responded to a motor vehicle accident on Spartan Ave. A vehicle had driven into a wooden fence. There were no injuries reported. BFPD responded with TVEMS to a rollover accident at the intersection of County Road 13 and Highway 56. There were no injuries reported. BFPD responded to a medical call on Charro Ave. The fire crew assisted TVEMS with loading the patient to be transported. BFPD assisted TVEMS with a medical call for abdominal pain on 4th Street. The patient was transported. BFPD responded to a reported grass fire on Lonetree Drive. The crew found a controlled burn that was extinguished. BFPD assisted TVEMS with a medical call for chest pain on Interstate 25 at mile marker 251. A patient was experiencing dizziness and chest pain. The patient was transported. BFPD responded to a two-vehicle accident on County Road 4. The vehicles sustained moderate damage. Two people were taken to the hospital. BFPD assisted TVEMS with a medical call for abdominal pain on West County Road 10. The patient was transported. BFPD responded to a medical call on Massachusetts Avenue. The fire crew assisted TVEMS with medical treatment and loading the patient for transport. BFPD assisted TVEMS with a medical call at the Berthoud High School football game. BFPD responded to a medical call on 1st Street. The fire crew assisted TVEMS with medical treatment and the patient was transported. BFPD responded to a report of a grass fire on 6th Street. The fire crew was not able to find a grass fire anywhere in the area. BFPD responded to a reported structure fire on French Hill Road. The residence was evacuated and the homeowner reported a smoke odor and the smoke detector was alarming. The fire crew searched each level of the home and found no signs of fire or excessive heating. The smoke detectors were checked and tested before the fire crew departed. BFPD assisted TVEMS with a medical call on 2nd St. The patient was transported. 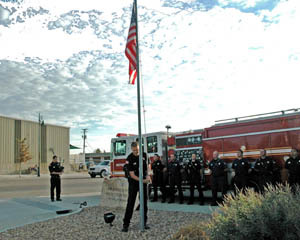 BFPD responded with TVEMS to Berthoud Living Center for a medical call. The patient was transported. BFPD responded with TVEMS to Berthoud High School for a student experiencing chest pain. The patient was transported. BFPD responded with TVEMS to a medical call on Bein St.
BFPD responded to a commercial fire alarm on Spartan Ave. The fire crew searched the outside and inside of the structure and there were no signs of fire in the building. The crew reset the alarms and left the scene. BFPD responded to a motor vehicle accident at the intersection of 1st St. and Highway 287. This was a single vehicle accident and one patient was transported. BFPD responded to 10th St. for a fire alarm. This was a false alarm. BFPD responded with TVEMS to a medical call for cardiac arrest on Marshall Pl. The patient was transported. BFPD responded to a dive call at Carter Lake for a boat that had capsized. When the crew arrived, they found that the park service had rescued the two people from the boat. Site contents copyright © 2019 Recorder Online	except as noted. All rights reserved. | 89 queries in 2.479 seconds.